No someone hasn't hacked my timber frame blog. I am running for United States Congress. If you have followed my blog over the years, or if you just found it this week and spent the last 20 hours of your life reading every post, you have a pretty good idea of who I am. I believe in freedom, independence, responsibility, teaching, learning, and building things that will last centuries. No challenge is too big, and no setback is ever permanent. Our federal government has a scarcity of leaders who are willing and able to address our nation's problems. I am not a typical politician, but I know I can help our country. A 10,000 foot survey of this race (I study everything before I jump! ), reveals that I can win it. I have been raising money, consolidating support, speaking, and meeting people for eight weeks. The momentum is building. The election is on May 22nd. I have a great on-topic blog post to add some day about the synthetic stucco we chose that solves the moisture drainage issues inherent with synthetic stucco. And another about the Eco Gen 6Kw backup generator that is finally wired up and working. Those will have to wait until at least June. In the mean time, please follow my campaign on facebook or at my campaign site. With your help, I could be blogging about solving the problems in Washington DC, next year. Thank you! If you have campaign oriented questions, please send me your name and phone number and email. (or use the campaign web site) I will try to answer your inquiry. Thanks! I'm an engineering student and Ron Paul supporter and found your site after his endorsement. You look like the kind of person this country needs, and hopefully people like yourself, Rand Paul, and Justin Amash will represent the next generation of the Republican party. So, it's great to see people like you running, and much luck in the election. I have spent the last few days trawling through your blog and thoroughly enjoying it, (with the exception of the political posts, it is irrelevant to me over here). It is odd that I only came across it via your youtube video, I often search there for stone related stuff. I am envious of the help that you receive from family and friends, most visitors to my place tend to hang around, waiting for me to stop what I am doing and put the kettle on!, as for my own family? well... let's not go there!. I've been working on my own place for 18 years now, it does take longer with only 1 pair of hands. Many of your ideas, such as the thermal heating have had my grey matter working and I may be able to incorporate it in my place. My blog is at; winkieg.blogspot.com , I can get back to working on an update now that I have made my way through yours. I saw your name during my usual scan of Google news and yelled, "Hey, I know who that is!". A long time follower of your blog; give them Hell. Just got to yell after seeing your name in my usual scan of Google news. 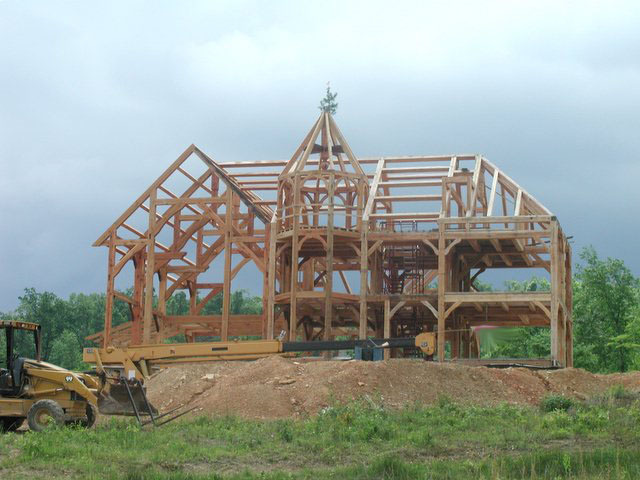 Long time reader but have dropped off lately, found your site while I was looking into timberframing and slate roofing. I'm happy for you; yes, we need more artist/engineers in government. Tear up that rats nest when you get there! Ok, I realize you're trying to save the country and all, but if you're home for Xmas, how about one house update? Is it completely finished? What's left? Any new pics?